Infused with Lip Repair Lipids and Konjac Root Wrinkle-Filling Spheres to visibly reduce the look of fine lines, zinc oxide for Broad Spectrum SPF 30 protection without chemicals, and a hint of stevia for a touch of sweetness. 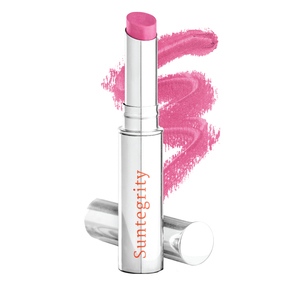 Suntegrity LIP C.P.R. Nourishes lips in rich, creamy color with a sun-kissed shimmering finish. Formulated exclusively with pure pigment, never dye, for color that won't bleed or feather into fine lines. Organic jojoba oil, shea butter and cocoa butter smooth, hydrate and moisturize for a lush velvety feel. Slim tube slips easily into purse or pocket for silky color and sun protection wherever you go! Suntegrity LIP C.P.R. is a Top Rated Sunscreen Lipstick by the EWG/Skin Deep Cosmetic Safety Database! Received a #1 Rating for “Best Lip Balms with SPF” in the EWG’s 2016 Sunscreen Guide. SHADE: Stargazer Bloom - a lively burst of pink.